You have a garden, it is summer it is hot ... what a super idea that a pretty wall fountain to refresh, fill in your watering can or just let yourself be rocked by the sound of running water! 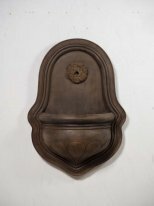 We have selected for you Chehoma wall fountains with famous models as of Vaucluse and Lion head. These resin fountains are designed to fit all exposures and even to harsh winters. Foam or algae can be attached to these fountains as on a real fountain of yesteryear. Finally, we specify that these fountains could be fed continuously or operated in a closed circuit.